It's Illustration Tuesday. 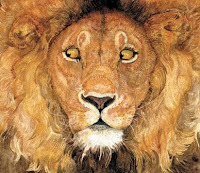 Jerry Pinkney has been illustrating children's books for many years. He brings his African American heritage and his storytelling abilities together in the art he creates. Read his brief bio, here, in which he discusses his work, then visit his website, here. In the video below, he talks about his latest book, The Lion & the Mouse, and how he approaches the storytelling aspect of illustrating. His enjoyment of making picture books comes through clearly when he talks about the process. Interesting how Pinkney expected to add the written story after he'd finalized the sketches and layout, and then decided that words weren't necessary...I wonder if kids who don't know the original tale will be able to fill in the blanks? Did you see the ZOOBOOK on his desk, that he was using for visual reference? It wasn't one of mine, but it was good to see an artist using ZOOBOOKS as an aid in his work. They do have stunning photos, usually. I did see that Zoobook and looked it up to see if it was yours!